Colorado River Adventures is a members-only vacation destination designed for RV enthusiasts. Located in the Southwest United States, it boasts 7 resorts in California, Arizona and Mexico. The company had been sending out lead-generation mailing pieces, but had noticed a response drop off in the previous 2 years. They enlisted Creative Direct Marketing Group to create a powerful new lead-generation campaign that would increase their prospects and pre-sell them on the benefits of a members-only resort. First, the competition in RV resorts is fierce in the Southwest United States. Arizona and California have hundreds of RV resorts, each touting their unique appeal. CDMG had to show that Colorado River Adventures was different enough from the competition to warrant a visit. A private, spacious oasis totally unlike crowded public parks. A place where members-only means friendship, familiar faces and a sense of security that could only come from a supportive community. The campaign also promoted the value of Colorado River Adventures’ network of different locations. River Adventures has prospects’ every vacation mood covered. With this new positioning, Colorado River Adventures became more than an RV campsite. It became a unique destination for the discerning RV enthusiast. 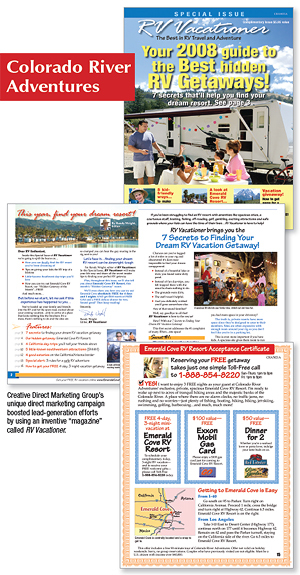 To showcase these dynamics, Creative Direct Marketing Group designed a magalog with the title RV Vacationer. Instead of a sales piece, the mailing now looked like an informative RV magazine for RV buffs. Two RV Vacationer front covers were tested. Both were built around the idea that the prospect was receiving the “The Best RV Resorts in the Southwest” issue. Once inside, the main article detailed “editors picks” for amenities that the discerning RVer needs in a quality resort: Spaciousness, privacy and loads of nearby activities among other qualities. These resort features were then promoted using Colorado River Adventures resorts. Sidebars broke up the main copy, spotlighting all there was to do at Colorado River Adventures resorts, as well as enjoyment for the kids, RV safety tips, off-beat activities and so on. Finally, prospects were told as RV Vacationer readers, they were eligible for a free 3-night stay along with a package of gifts like a deluxe dinner for two and a free gas card. For prospects who needed a bit more research, an Internet landing page was created to continue the “story” of Colorado River Adventures. Engaging video footage, large pictures and unique rollover graphics added to the experience. The site also had easy-to-use maps, loads of customer testimonials and an additional spotlight on the valuable invitation to visit. A fun newsletter sign-up was also created to boost lead-generation efforts. Thanks to CDMG’s positioning, the campaign exceeded the client’s expectations and significantly boosted the resort’s leads and sales conversions. Overall traffic to the company’s Internet landing page also skyrocketed and led to increased email newsletter sign-ups for even bigger sales opportunities in the future.